We want your table to look spectacular this Thanksgiving, so here are some table design ideas for Thanksgiving that will have you celebrating in style and wowing your guests. Remember to visit or call one of our showrooms for more details on inventory, pricing, and availability. 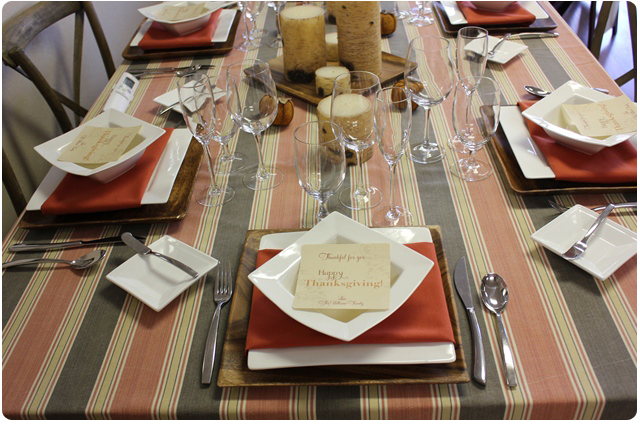 For our first Thanksgiving table design, we combined La Tavola’s Spotswood Stripe Espresso Linen with Burnt Orange Napkins, and added our square china and Kya flatware to create a rustic, autumnal look with a modern twist. If you are serving soup, our square bowls are an classic touch. 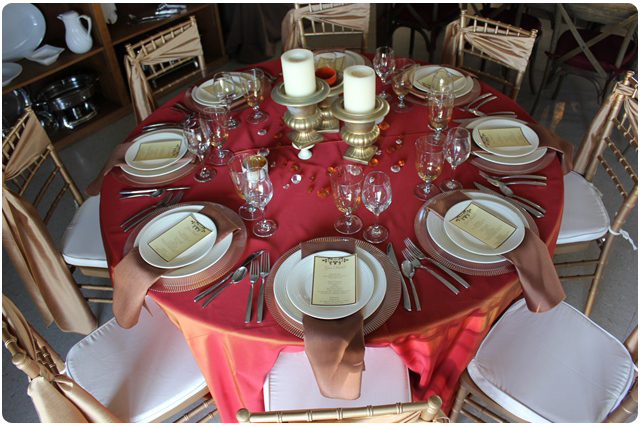 The autumnal theme continued with wooden candle centerpieces that look amazing with the bistro chairs. This unique and fun design has all of the colors of Thanksgiving. 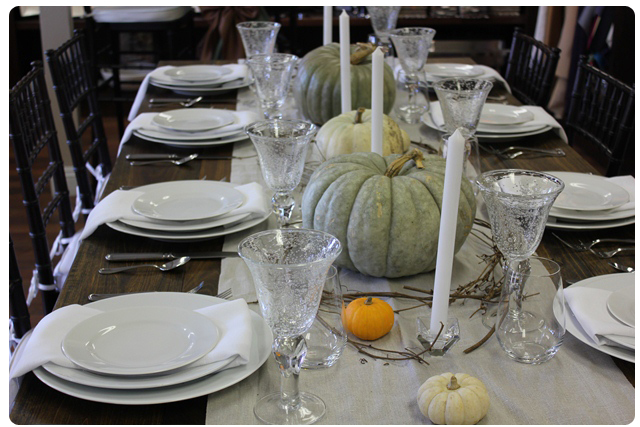 We used our farm tables, mahogany Chiavari chairs, natural colored runner, and let the pumpkins provide the color! Visit your local pumpkin patch or grocery store (they will be much cheaper now Halloween is over) and pick up some green, white, and orange pumpkins of different sizes to place down the middle. To finish off the look, add some taper candles in a glass holder or even hollow out small pumpkins for candlestick holders. Once the dinner is over, you will have plenty of pumpkin ready to be transformed into delicious pumpkin soup or pumpkin pie. An edible Thanksgiving table design, what could possibly be more fun than that! This is a classic Thanksgiving look. Shantung chocolate lines are complimented with a gold Shantung runner, gold Chiavari chairs and Topaz olive napkins. 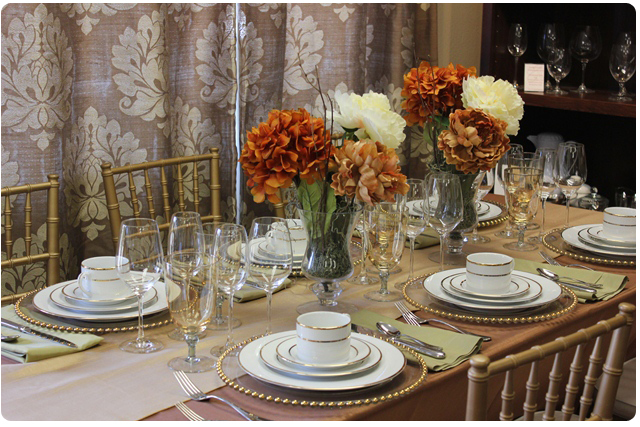 We used our gold rim china pattern and our gold goblet glasses to finish off the look. Visit your local florist to pick up fall style centerpieces with rich and regal coloring. 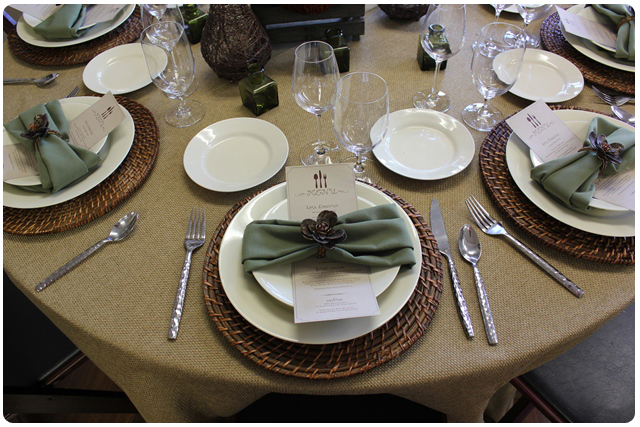 This is our specialty linen, Spice Topaz, with Shantung Chocolate napkins. We featured our amber luster chargers and our ivory pattern china and combined classic Kya flatware with elegant glassware. To finish the theme, we used our gold Chiavari chairs with a gold sash. 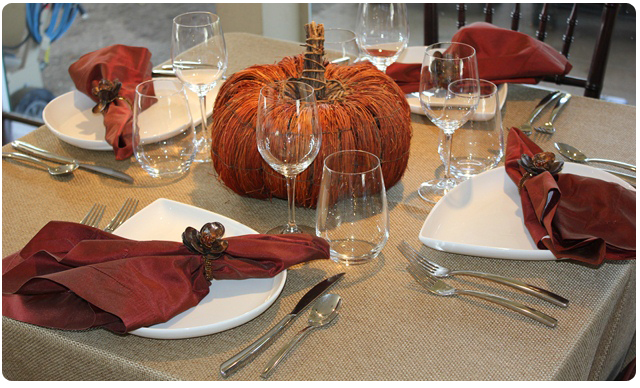 The most popular colored linen of the fall season made its appearance on our Kings table, which is a great size table if you are serving your dinner at the table or hosting a family style Thanksgiving event. We featured our new jute runner with our ivory pattern china and mahogany wood folding chairs. This size of table gives you plenty of room for all of your guests, as well as all of your food and wine. This Thanksgiving table design is simple, classic and most of all, adorable. We used our chocolate lines with white runners placed horizontally to create a different look. 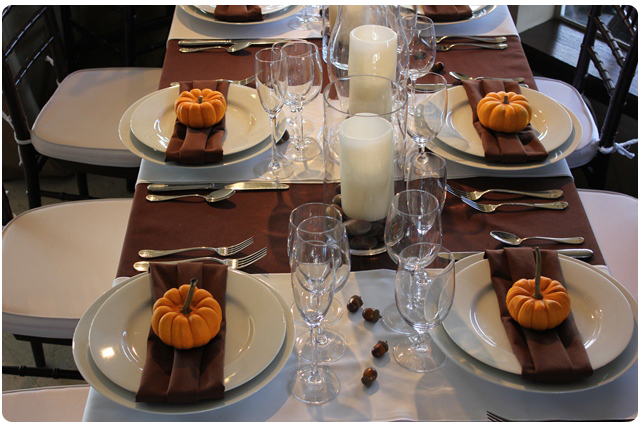 We brought in the fall theme into the design with white pillar candles and small pumpkins at each place setting. 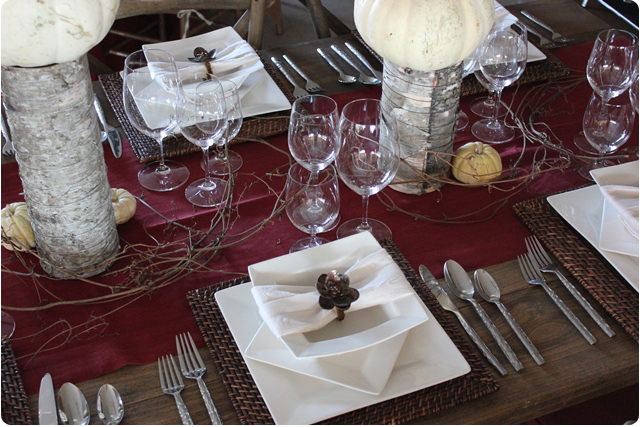 This Thanksgiving theme is perfect for a small, intimate dinner celebration. The table is 36” square and 42” high. We featured our mahogany Chiavari barstools, super fun petal plates with mahogany topaz napkins and chair pads from La Tavola. Finally, our farm tables are featured one last time in combination with our bistro chairs. 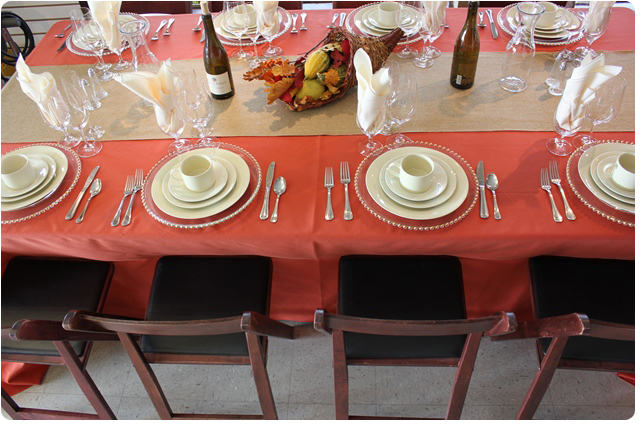 For this Thanksgiving theme we placed a wine colored runner down the center of the table and used matching chair pads. We brought in our square china once again and created a rustic look with the centerpieces. The big white pumpkins here look amazing with the deep colors of the table design.